Vietnam is a fascinating and ever evolving destination full of friendly people, and therefore a fascinating choice for many of our volunteers. 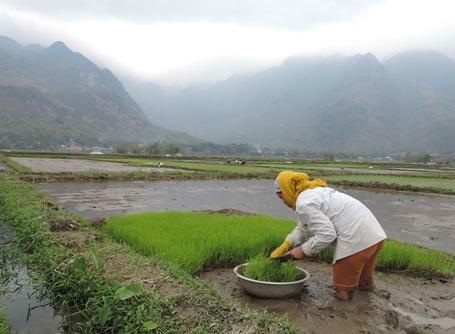 Our group trips in Vietnam are open to anyone with a passion for volunteering together in the developing world; including those at school, in a community group, at university or working together. Projects Abroad offers a variety of projects for groups to join in Vietnam. Groups can get involved in Care/Teaching, Community, Sports, Language, and Medicine & Healthcare – including Medicine, Occupational Therapy, Physiotherapy and Speech Therapy, Projects. 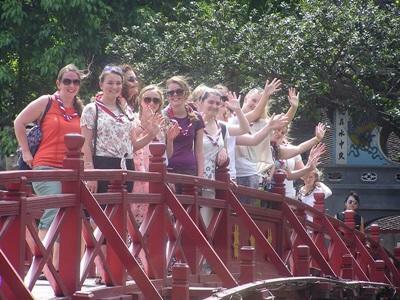 Community volunteers from Ambleside Guide group in the UK, visit the temple on Hoan Kiem Lake. Following the three decades of war that ravaged the country, Vietnam is now a one-party communist state that has set its sights high for development; this can be seen in the fact that it is now one of the fastest growing economies in South-East Asia. Hanoi may seem chaotic when you first arrive, but as a volunteer living and working in the city you’ll discover the gracious Vietnamese people, explore the charming old town and find hidden temples beyond the throngs of motorbikes and urban bustle. 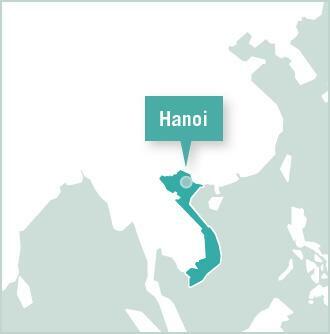 Hanoi is the cultural highlight of Vietnam, with over 600 pagodas and temples to visit. The city continues to change rapidly as the current economic boom adds more high-rise steel and glass hotels to the French colonial architecture, traditional markets and ramshackle shops. Although Vietnam's economy has grown rapidly in the last few years, there are still many development issues that need attention. Groups volunteering in Vietnam will stay in local hotels within the city of Hanoi within easy access of their placement location. Staying in a hotel ensures that both work and free time can be arranged and organised amongst yourselves much easier, as well as the fact that you’ll be located in a much better location to really explore everything that the city has to offer. 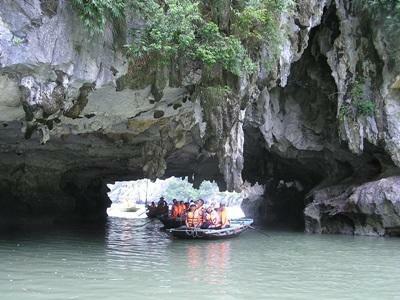 Projects Abroad Care & Community volunteers from Ambleside Guides Group in the UK take a trip in bamboo boat through caves at Halong Bay. In the evenings and at the weekends, groups will get free time to spend as they please. Most evenings will either consist of finding a spot to relax and unwind or exploring the local area, whereas the weekends will be used to integrate a trip of your choice to another part of the country. For those looking to escape the hustle and bustle of the city at the weekends, head to Ba Vi National Park, where there is excellent trekking, wildlife viewing and over 1200 steps to reach the mountain summit for panoramic views over the city. Or relax and try the local sea food at Halong Bay beach, the closest beach to Hanoi. Even after your placement has finished, groups have to option to carry on travelling by their own means to really explore the rest of what Vietnam has to offer. This could include hiking in mountainous Sapa, staring in awe at Halong Bay’s soaring limestone islets or shopping for a new tailor-made wardrobe of clothes in fashion capital Hoi An. If this all sounds a bit active then head south and enjoy some laid back beach vibes on the island of Phu Quoc. Many volunteers choose to travel on through South-East Asia to Thailand, Cambodia or Laos, which can be done cheaply, if not always quickly, by bus and train. There are also now many low-cost budget airlines, which allow you to explore the region further, even without months of extra travel time.